Kyle cares about the customers experience from the moment they walk through the door. At age 16 Kyle was one of the first of Alika’s friends to hang out at iParts and to start learning to repair (at that time) Apple iProducts. Bella Vista High School graduate 2012 and active playing all sorts of positions in baseball for years Kyle became an iParts team member while still in high school. Kyle has broadened his technical skills with time and experience jumping into an industry which was newly created and has grown with it. 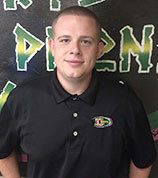 Kyle has learned comprehensive repair of Apple, Samsung, HTC, Nokia, LG, and Amazon devices and he has also taken certification classes for micro soldering. In Kyle’s spare time he likes to fish on the river, work out, and spend time with his family.